Luxurious style with a handcrafted look that rivals fine custom racking. This 3 column wine rack kit does not include a display but its affordable price is one that only a modular kit could offer. Holds up to 60 wine bottles, this wine rack has great appeal by itself or as a component within the wine rack kit system. Luxurious style with a handcrafted look that rivals fine custom racking. This 3 column wine rack kit does not include a display but its affordable price is one that only a modular kit could offer. Holds up to 60 wine bottles, this wine rack has great appeal by itself or as a component within the wine rack kit system. Never-before wood and finish options that let you enhance your beautifully grained mahogany racks. 3 Column Rack Kit w/o Display. Size: 72"H x 14-3/16"W x 13-1/2"D - Made in the U.S.A.
will this hold champagne bottles? BEST ANSWER: Yes, this 3 column rack will hold up to standard Champagne bottles. Is there a solid back on these wine racks? 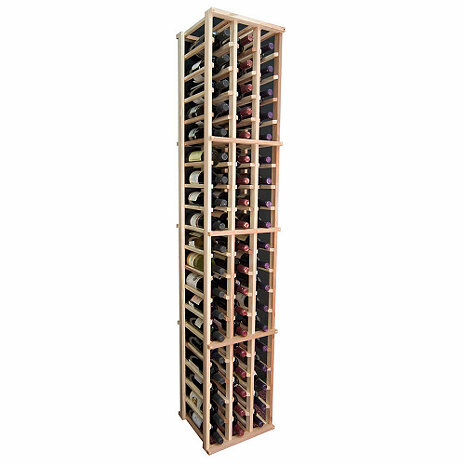 BEST ANSWER: The Sonoma Designer Wine Rack Kit - 3 Column Individual does not have any type of backing on it. This racking offers custom features with modular pricing. No, The back is open.